Description: The great and pedal organs are unenclosed. The swell and the choir organs are under expression. The organ is in excellent shape and completely original. The Erzahler and celeste in the choir division, and the Plein Jeu IV in the swell division are especially nice. The pedal division has a complete Principal chorus - 16, 8, 4 and Mixture iii with no borrowing. The organ has been recorded note for note and virtually assembled in the same fashion with the ODF. We have included the sfortzondo piston and the crescendo pedal. The combination action includes six divisional presets and ten general presets, for a total of 33. The 24 note Deagan chimes are very nice. They are playable from the great manual at mezzo forte (MF) and from the choir manual at fortissimo (FF) while being under expression. This may be a first for Hauptwerk. Studio processing included seamless looping of each pipe sample (note by note), and critical noise reduction artistry to reduce the rumble created by the blower. Natural releases of each note were recorded and included for the best possible realism. The organ has a bright and open quality that can be voiced in Hauptwerk to accommodate your speaker system and room. The Ozark Christian College chapel building began construction in 1965. It has a seating capacity of 1100. It was not originally planned to have a pipe organ, but a generous donation from the Philips Foundation given during construction made Opus 918 possible. 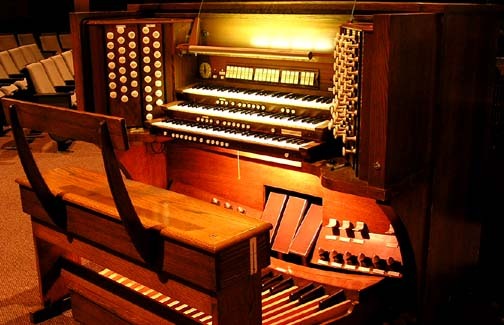 The organ's purchase price was $70,000. The upper areas of the platform were dramatically redesigned and reconstructed to accommodate 46 ranks in four divisions. The pipes are positioned in tall chambers. None of pipes needed to be mitered. All the pipe work is behind acoustically transparent grill fabric. The chamber layout is very straightforward. The great and pedal organs are positioned in the center rear of the platform about 10’ above the stage floor with two large chests and several offset chests. The swell chamber is to the west at a 30 degree angle to the great with two chests placed one above the other and two offset chests. The choir chamber is to the east at a 30 degree angle to the great with two chests placed one above the other. The chimes are located at the rear of in the choir chamber. The 24 bit, 48k stereo samples are recorded in Mid/Side stereo, chimes are recorded in mono. The sample files require 2.3 gig of memory. The samples are recorded dry, additional reverberation is recommended for proper presentation in smaller rooms.